I'm working with slippery rayon again; this time it's with four sided continental stitch. It's going really slowly and doesn't look like I'm even making much of an impression because it's only one strand. Anyway, it's taking a looot longer than the string art it's falling down from. Of course, not much on anything's going to be done this week. I leave for Louisville and the EGA seminar early in the morning. I'll be blogging from there and show some new things, but my old stuff will languish some. Since this is due a week from Monday, I've been working on it almost exclusively lately - a hard thing for me to do! I finished the seventh band and then managed to do all of the eighth this week. The pattern called for gold where the blue is, but there's no gold anywhere else except the bottom, so I'm sticking with blue. Just started the ninth band, which shouldn't take too long. Maybe I can get it done today before I leave for seminar in the early morning tomorrow. I'm once again working with this Treasure Braid color that reminds me of dayglo green. I'm not particularly thrilled with how it looked up top at the basket, but maybe it will be more tempered by other colors in the lady's dress. This is my last portion of the piece. Once I'm done putting her in, it gets beaded and then framed. Yay, so close! But I won't get any done for a couple weeks, I think. Two full sides done on the specialty stitches and only two more to go, both of which partially done. This part would be done now except for the interstitial work on the crazy quilt blocks and now the push on the English Sampler. Well, that and being in the car for long car trips. I've had a busy couple of weeks. It'll get there. This week's work was mainly on the flag. It's coming along pretty well but will be slowing down next week because I'll be at EGA seminar and stitching other projects. I spent all of yesterday evening doing my work on Kerry's block. I'd gotten it late due to the post office taking nearly a month, so it's already late for its mailing. This round robin requires us to use a certain stitch for a seam treatment every month. This month was herringbone, with an optional lazy daisy. I did one of each. The seam on the left is the herringbone and the one on the right is the lazy daisy. I hope she likes it. Well, you can see I'm through the middle of H now. It's getting there, though, and I'll be doing more work on it this week. It's still going to be a fairly quick (for me) stitch. I finished up my work on Ann K's block for the my favorite things round robin. I must say that the huuuuuuge light green solid piece intimidated me, so I didn't do it. I just never, ever have pieces that large on my blocks and I prefer smaller ones. Anyway, I did the next biggest block, the light blue, and covered it with flowers and bugs. Then I did the seam next to it in a kind of different way. Decided I should put something traditional on it, so I beaded the seam in the bottom left corner with golden bugle and seed beads. You can see a better detail of the weird seam and flower block below. The ladders on each side are done now; I'm not sure if they're supposed to be vines or leaves or what. There are leaves in mosaic stitch coming in off them. I started them yesterday and really wasn't pleased with the look. I might go ahead and frog that then just cross stitch them. Will decide later this morning. This medallion in the center is really, really big. I started it this week with a little bit of string art. I need to move faster on this because it's so close to finishing, but other things have higher priority. I'll get to it. Anyway, so far this medallion's gone okay. Only one counting mistake that I caught early. Wish me luck! 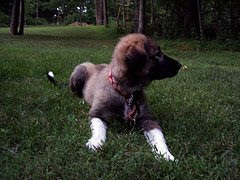 The other night someone asked me why I hadn't posted more about Mattie the Kosovo wonderdog. So I got my husband to take some pictures of her yesterday. She's grown. At four months, she's forty pounds. She's also developed the taste for and the ability to get cookies off the dining room table. Today, she tried for chicken quesadilla. She was -not- successful. Anyway, she's a really happy and enthusiastic puppy and she's growing cute again with the mange clearing up. 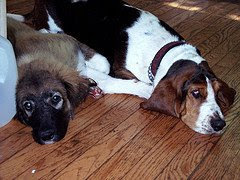 Here she is with her sister, the full grown basset Emma. It gives you kind of a perspective on her size. Finally that bit in the middle that looked like a crab to me is beginning to look like something more in keeping with the sampler. A leaf! I see a leaf! The four parts for this section are all in the bottom half of the sampler for some reason. I should get it done in plenty of time. I decided to do something different with a seam treatment this time - I'm making a flower pot with vines growing up the seams. They'll get flowers and such on them. So far, the pot and vines are made in this picture. I'm almost done with what I'm going to do before mailing. So Poirot has twelve sides now, even if four of them are really short. That whitish line is all smyrna crosses. I'll be doing string art in the middle next and see how it goes. This week's progress is a bit harder to see because the colors I mainly used were light. You can see some against the flagpole and farther to the left on the skirt. Got some more work done on band seven this week. I used medium green because I thought it stood out more. It's coming along and work will accelerate this week once I've finished part eleven of Totales Mysterie. More slick thread to work with, and more string art. I got both sets of starfles done this week. Not sure what I do next. I just -hope- it's not more of the Edmar. That stuff's hard to work with. I'm going to have to do some repair work when I'm done with this. My puppy Mattie dragged it off my desk and managed to break a couple of threads on the crescents on the band above. She's getting into everything, and she's tall enough that nothing's safe. Three more letters to go, so five done. Nothing spectacular to talk about, just progress this week. The third corner is coming along pretty well and is about halfway done. These corners go much more quickly than the gardens of part three did. I've decided to get rid of the lazy daisy stitches and do back stitches instead on the vines. The lazy daisies just aren't standing up very well. That'll be done once I have all the cross stitch done on this part. I'm still working on the top border of the eighth band. The soysilk is still shredding in single plies, so I'm having to take it really carefully. On the other hand, it's over halfway done. I've completed my first motif for Ann K's favorite things block. She wanted flowers, so I gave her flowers in three different styles and added a few insects for good measure. I'll be doing a seam next. I'm feeling happy about the progrss I made this week. One full corner (the top left) is done and half the Algerian eyelets are done on a second. I feel like I'm making real progress toward the next step on this. This week I added more red to the flag, bringing the overall flag farther down. It's a biiiig flag, though, so there are several more red and white patches to go. I also outlined one of the major folds of her skirt, bringing it down almost to the end of the pole. Really beginning to make visible progress on this. This afghan is going off to Kosovo. One of the embassy's locally hired staff is having a baby this month (at least, his wife is). He helped tremendously in getting Mattie back here to the States, and I wanted to do something to thank him. According to my information, the baby's supposed to be a girl. Afghan is made out of Bernat Satin and it's soooo soft. Worked up fairly quickly for being a dense all double crochet. I hope they like this. This also makes my third finish for the 25 project challenge. This is going fairly quickly and I should be able to finish it by the end of September at latest. I'm already on F, which is about a quarter done. The colors of the floss I'm using go really well with the other colors on the piece. See Anda? I got even more done! I did the darning stitches in the big leaves and started the satin stitches in the small ones. Those satin stitches were supposed to be cream colored, but I wanted them to look like real leaves, so I used light green. It's coming along pretty well, and I have more stitched than this picture shows. I did more string art this week - spirals in the two top corners. They took up a lot of thread but were fairly easy to do. The hardest part was working with the rayon threads. They're from Edmar and are meant for Brazilian embroidery. All I know is that they tangle often and coil around themselves, making these string art bits with them extra difficult. They look pretty, at least. I don't think I'd use them for a project of my design, though. I'd be more likely to use a silk perle or something similar. I'm over half done with the header now. Those letters are wide, so they take up a lot of floss. Easy stitching, though. There are only three colors of floss for the whole design. The CQ Embellishing group on yahoo is having a round robin. The theme is "my favorite things". The steampunk block I posted a couple of weeks ago is part of that round robin. I received Ann K.'s block a week ago and have started working on it. She has a LOT of favorite things, so it's pretty easy to put something on her block. What I've started on the light blue area is a small flower garden. The stems are stitched now, with whipped chain stitch. I've crocheted three small flowers for it and will be adding a button or two and some ribbon flowers for the rest. Then I'll work on a couple of seams. Two of the corners are now done and I've made a good dent on the third. These go pretty quickly, even though there are three different colors of blue in each. I'll be happy when I can go beyond this central square. I finished band seven this week and started band eight. Only four more bands to go. Eight is a large one, and I tried something different for the top part - I took apart the plies of one of the colors of perle thread. It's very fragile to work with, so I wouldn't recommend it. It doesn't pill - it just pulls apart unexpectedly. I finished up my tenth installment last week and am now officially halfway done with this leafy sampler. Some of the motifs are completely done; some are partial; and I'm sure there are some surprises left. For example, I have no clue what's going to be going on in the corners. Maybe the next installment will have one. I'm about halfway done with part five and even got a bit of part six done this week. I might even have part five done by the end of August. Rhodes stitches take a lot of time and floss to do, but they're lovely. I completed the Rhodes stitches on one corner and started a second this week; this is going a lot faster than all those cross stitches! I haven't started on the Algerian eye stitches yet, but will soon. I was working on the second of my four squares when this was taken nearly a week ago. It's coming along pretty well and the motifs are able to be seen pretty well. Still only available at the Marquoir group on the German Yahoo site, and they still do everything in non-English. I decided to go ahead and start my June ornament. It's Poirot by Jim Wurth, part of is dodecagon series. The first step is an outline completely in smyrna cross. I'm almost halfway done with that part. It's not that big, so I shouldn't take too long to complete it, right? I wasn't going to post this today, but Anda asked about it last night, so I am. Just for her. See Anda? I made progress! It'll be done by September 8th, I promise. For the rest of you, that's the date it needs to be sent to the evaluator. There are two more bands after the one I'm working on, and this one's the largest. It'll be worked on more often now that the due date's only a month away. I found a suitable alphabet to fill in the big blank middle online a while ago. It was from a French site, so it was perfect. As you can see, I started it and got two and a half letters done. I'm using Vikki Clayton's Russian Sage premium floss. I like the way it blends with the other colors on the piece. Small bits of the flag are done, but the major work this week was the skirt. Completed an oval outline of light yellow and made some brown stripes. Goes fast when you work on it daily and there are big, easy blocks to stitch. Finished up the second corner's braiding and started on the third, then did the jessicas on the upper corners. Lots of stitching on this band, and I haven't even gotten near the middle yet. Plugging away at this; almost halfway done with the name. The design sheet is huge, so it's funny to see the actual stitching so much smaller than it. That said, it looks like a much bigger project than it is. Instead of working part three's specialty stitches, I decided to finish up part two first. It's -all- blue. I've got almost all of the second corner done and added a rectangle and a half to the bottom part. I'll get there. These corners aren't very big. I'm almost done with the seventh band now; as you can see, it's much smaller than the previous band (thankfully!). I think the perle I'm using is a bit thick, but it's coming along all right. This isn't in my rotation at the moment officially, but it's a project my face to face EGA chapter is doing. There are several kinds of crossed stitches and it's somewhat patriotic. It's also small, so it should be a quick stitch. What I did here was done in two hours during the meeting a couple of weeks ago. I hope to finish off these stripes before the next meeting a week from Monday. Part five is mainly these two scrollwork bits. They have some backstitching and a couple of cross stitching inside, so they should go easily and quickly. I hope so! I made two mistakes on the border early on and didn't realize them until I was nearly done, so they stuck. This is my May ornament for my ornament a month - yes, I'm very behind. I'll be keeping it, since it has those flaws. Otherwise, I like it. This also counts as the second finish in my project challenge. I'm adding Poirot, one of Jim Wurth's dodecagon series, into the rotation as this one's gone. It's an ornament too, so it'll be July's. From what I understand, the dodecagon ones work up fairly quickly... we'll see.